It has been crazy busy around here. Flick and I have been swamped with so many things, on top of having a teething and sick Baby Bell. After a lot of thinking and talking with Flick, we have decided to take a small break from the blog and podcast. This is not permanent. I have really enjoyed sharing my thoughts and stories, but we have something big we are working on in our personal life, and it needs my full attention. Thank you all for your consistent reading. We will be back and better than ever soon! You Want Me To Do What At Work? My breast pumping days are behind me for now but I’m surrounded by all of these first-time-moms who are learning the ropes. Pumping wasn’t as daunting as I had imagined but I did have moments of frustration and so did Baby Bell. There is so much to learn as a new mom and just when you seem to be getting the hang of things, you realize you can’t be constantly attached to your baby 24/7. Oh, and if you ever get sick, that’s a whole different ingredient to through in mix. If you are a breastfeeding mom, chances are, you will eventually need to pump. It might only be once or it could be everyday like me. Breastfeeding is a learning experience for both you and your child. Pumping and bottle feeding is also a learning experience for you both. In this week’s podcast, we talk about the challenges we, as a family, faced while I was learning the art of breast-pumping. We will discuss why you would need one; types of pumps; getting a pump through your insurance; going from breast, to pump, to bottle, to baby; pumping at work; and milk storage. Below are some helpful links to resources we used while pumping and some of our favorite brands. Please remember that the information we provide is only a stepping stone in the research process you should be doing. Every momma is different, every baby is different, and we are far from professionals. Thank you for reading, we hope you listen, and don’t forget to give us feedback on Twitter, Facebook, and Instagram. You may feel like your mind is in a million places and you don’t know what the answer is but if you just reach out someone will grab a hold and pull you aboard. I don’t know much about my family history. I’ve been told I have a rich German heritage and possibly some Irish. Needless to say, I never really participated in any events to celebrate my family’s heritage. So when I met Flick, I was in awe of his family’s Irish traditions. Now that we have Baby Bell, I want her to know more about where her family name comes from and what it means. Every year we attend a St. Patrick’s Day celebration with Flick’s family. It’s your typical “Americanized” St. Patrick’s Day party. We eat corn beef sandwiches and Irish stew. Baby Bell loves smoothies, so I’ll be making her a special green smoothie. This year Baby Bell has cute little green Converse to match her tartan skirt made by my talented cousin. I searched and searched for a skirt for her to wear that matched Flick’s kilt. I could n’t find very many and the ones I did find were outrageosly expensive. So, I hired one of my crafty, talented cousins to make one. It’s adorable and now she is selling them on her Etsy site for a very reasonable price. Oh, and I’ll be wearing her in my new Little Frog woven wrap (it just so happens to be green). As you can tell we have alot of fun with the whole thing. While we do celebrate the American way, we also work in some traditional Irish facts and festivities. It’s an event I look forward to every year. While the weekend activities are fun, we want Baby Bell to also learn her “true” heritage. We have started to look into different ways of doing this. We found books, music, and recipes to make it interesting for her. This will be more influential as she gets older but it will be fun to watch her learn more and more through the years. If you have some tips on how to help us teach Baby Bell about her Irish heritage, we’d love to hear them. I’ll be posting some photos from our weekend celebration on our Twitter, Facebook, and Instagram. We’d love to see how your family celebrates St. Patrick’s Day too. As always you can hear more on the Momstracted Podcast. Why is Baby Bell so happy? She gets to share here new favorite CD with one lucky reader. 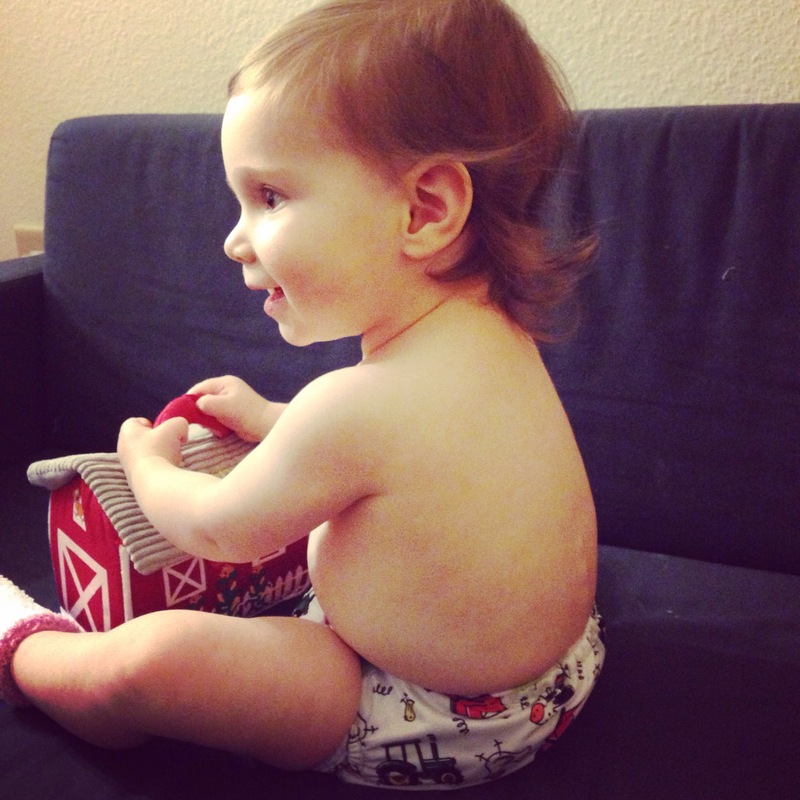 Enter here to win a Miss Jamie’s Farm CD for your little farm hand. We are still recovering from what was a long, but VERY exciting weekend at MommyCon Chicago! Flick, Baby Bell, and I attended the full-day convention on Saturday from 9:00am to 7:00pm. After registering, we promptly went to get our give-away bags. Flick had to wait to get his because he was volunteering. I think a “give-away bag” is an understatement. This thing was loaded! There was everything in there from baby wipes, to nursing pads, and even a baby shade cover. Not to mention everyone with general admission got a Kiinde Starter Kit. I chose the Foodii system and Flick got the Twist Starter Kit (breast milk storage system). The day really got started with shopping in the exhibit hall. There were some familiar brands, and some I had never heard of before. There were so many wonderful vendors, but some of our favorites were Chompy Chic Chewelry, Innobaby, Nicki’s Diapers, Crane, Grovia, Babyganics, and our new friends at Miss Jamie’s Farm. Besides fun places to shop, there were also some great exhibitors that gave helpful information. One of those being the child seat safety techs. We had several questions on whether it was time to transition Baby Bell from her infant carrier to a convertible seat. There were so many options for carriers. We weren’t really in the market for a new carrier. I have a Tula and Flick has a Lillibaby. However, if we had been, there were quite a few resources we could have taken advantage of at the convention. We got some helpful advice from past attendees to pack a lunch, as opposed to eating there because the food prices were high, and they didn’t have many healthy options. So we laid our blanket out in one of halls, along with many other families, and had a nice little picnic lunch. By this point, Baby Bell was way past nap time and getting very fussy. Flick had the Papa’s Perspective workshop to get to, so I decided to walk with Baby Bell to help her fall asleep. That is when I stumbled upon one of my favorite parts of the convention. I mean, only a mom would think of a quiet room. It was exactly that. It was a separate room with dimmed lights where moms could go and nurse and get their little ones to sleep. It was perfect. Baby Bell fell fast asleep within 10-15 minutes of me bouncing and rocking her. Then she and I relaxed in a chair and she napped for about half an hour. A half an hour doesn’t seem like a long time, typically she naps for much longer, but it was a perfect way to re-energize her for our next workshop: Miss Jamie’s Farm kids music show. If you haven’t heard of Miss Jamie’s Farm, you have to go to her website and check out her fun farm-themed children’s songs. We’ve been playing the CD and shaking our shaker egg ever since. Miss Jamie was kind enough to give us a CD to give away to one of our readers. Check out the Momstracted Facebook page for your chance to win this awesome CD for your little farmhand. We had some extra time before our next workshop, so we ventured back into the exhibit hall and talked to some of the vendors we missed earlier in the day. We also took Baby Bell to create some hand and foot print art. We created a cute little whale from her hand print and a blue bird from her foot print. Our next workshop was Potty Training with Potty Schmotty. She presents a very simple but effective way of potty training your child in 3 easy steps. To learn more about her process, check out her website. We finished the day with none other than the The Baby Guy NYC, Jamie Grayson. Let me tell you, this guy knows his baby gear. And he is quite entertaining, to say the least. After car seat safety, Jamie and the fabulous people from MommyCon gave away some AMAZING items. Everything from travel systems, to co-sleepers, to Tekhni woven wraps. Unfortunately, we didn’t come home with any of these gifts, but there is always next year! So, that sums up our first ever MommyCon experience. We have some exiting news for all of you. We will be recording our debut Momstracted Podcast. Stay tuned for more of our MommyCon adventures when we roll out our podcast. Until then, keep following us on Instagram, Twitter, and Facebook. Oh, and don’t forget to check out Facebook for the Miss Jamie’s Farm CD giveaway! So part of being momstracted is being completely invested in learning all I can about anything and everything “parenting.” It honestly never leaves my mind. So, one day I decided a good way for me to learn more was through parenting/mommy conventions and expos. There are a few in our area, but not a ton. I found Family Fest, but wanted more. That’s when I stumbled upon MommyCon in Chicago. I sent Flick a link to the page and mentioned that I would like to go. I was so excited when he said yes! Well, a few days went by and I mentioned to him that we needed to buy our tickets. Turns out, MommyCon is kind of a big deal and they were already sold out. Flick felt terrible and being the wonderful husband he is, went straight to social media to try for tickets. Let me just tell you, he didn’t rest until we both had full-day general admission tickets. He is even volunteering at the convention in order to get the second ticket. Now you might be wondering what all the fuss is about. Me too! I’ve never been but I’m expecting big things at MommyCon Chicago. They have 8 different MommyCon conventions happening in different cities across the country. Shopping – They’ve announced over 35 exhibitors. I can’t wait to get in there and learn all about the latest gadgets, toys, and products. Activities for the kids – It’s kid friendly. I am so excited for Baby Bell to participate in the activities they have planned for the little ones. How fun do these sound?!?! The SWAG BAG and Giveaways! – Who doesn’t love a goodie bag?!?! According to past attendees on the Facebook group page, they don’t skimp on the freebies. Flick, Baby Bell, and I are super excited to see what the MommyCon hype is all about. We will find out this weekend! Can’t wait to share it with all of you when we get back. If you are too intrigued to wait, then check out the upcoming MommyCon events.